Dimitrios Tsirkos first became a Mister Softee franchisee in the mid 1980’s. To be clear, we are talking about the ice cream truck business. Over the years, Tsirkos entered several franchise agreements with Mister Softee and ultimately controlled sixteen Mister Softee franchises with a territory spanning parts of Bronx, New York and Queens Counties. At some point in early 2014, Tsirkos apparently breached his franchise agreements with Mister Softee. Specifically, Tsirkos stopped remitting royalties to the Company and stopped taking his ice cream trucks to the designated ice cream truck depot for cleaning and storage. So, on February 28, 2014, Mister Softee sent Tsirkos a notice terminating his franchises. Not surprisingly, the franchise agreements contained broad non-compete provisions that prohibited Tsirkos from competing in the ice cream business anywhere in the New York City metro area for a period of two years. Tsirkos, who had been in the business for nearly thirty years, had no intention of going away quietly. In his view, Mister Softee had breached the franchise agreements first (more on this later). So, Tsirkos was staying in the business. In fact, not only did he intend to compete with Mister Softee, he planned to leverage the Mister Softee brand: Tsirkos labeled his fleet of ice cream trucks as Master Softee and essentially ripped off the Mister Softee design: similar name, same blue and white color scheme and a very similar anthropomorphized ice cream cone character wearing a blue jacket and red bow tie. The pictures are below. Ultimately, Tsirkos changed the name on one of his trucks to read Soft King, but that truck retained all of the other Mister Softee hallmarks — even adding the words SHAKES SUNDAES and CONES to the side of the truck (as Mister Softee does). Mister Softee quickly got word that Tsirkos was not only competing against them in the ice cream business, but also was ripping off the Mister Softee brand. Mister Softee sued alleging trademark infringement and breach of the non-compete provisions contained in the franchise agreements. This one was never even close. First, the trade mark infringement claim was a slam dunk. Mister Softee had a registered trademark for the name, the trade dress of the truck and the ice cream cone character. Tsirkos’s Master Softee fleet of trucks was a clear knock-off. 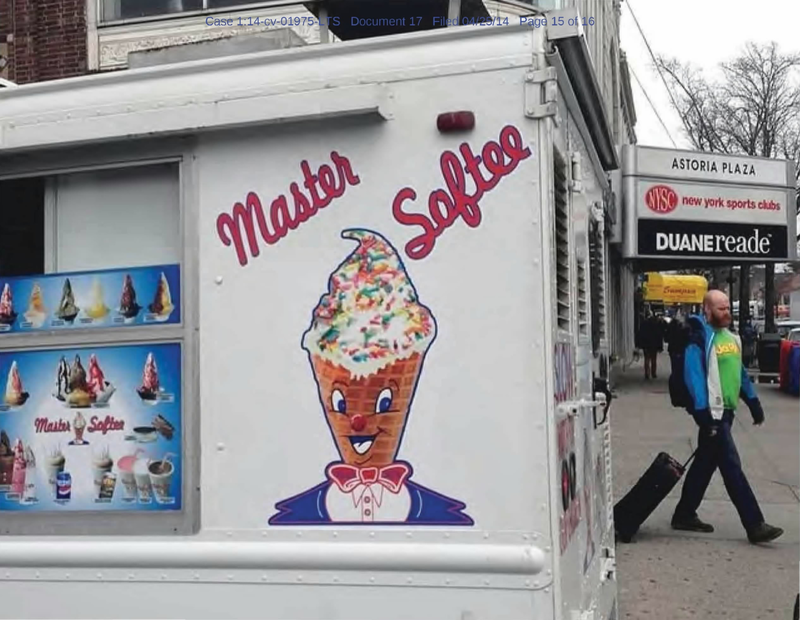 As the court noted, everything from the name to the visual appearance of the Master Softee trucks was “strikingly similar” to the Mister Softee fleet. Beyond this, Mister Softee proffered evidence of actual consumer confusion, the sine qua non of a trademark infringement case. 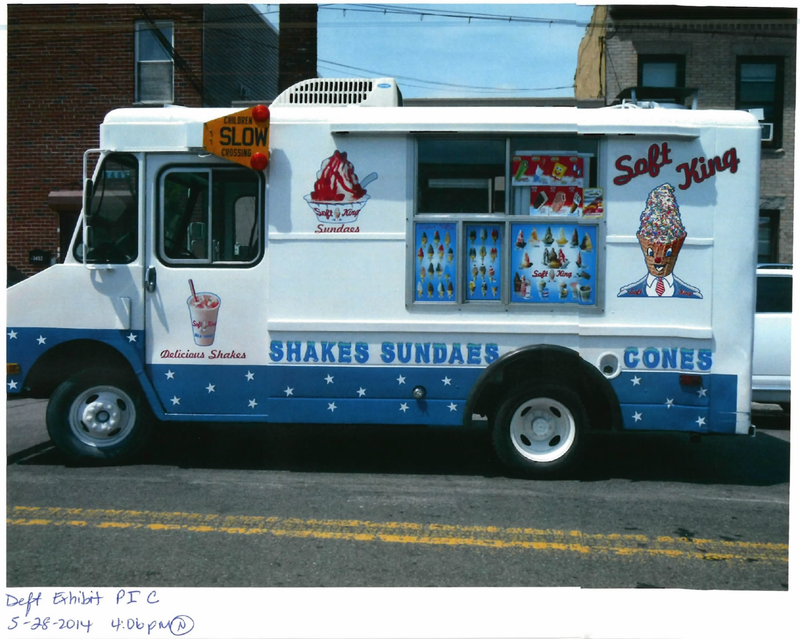 Based on its strong showing on the trademark claim, the Court found Mister Softee was entitled to a preliminary injunction to prevent further infringement. Turning to the breach of contract claim, the court also found a preliminary injunction was warranted to enforce the covenant not to compete. First, the court found that Mister Softee had a legitimate business interest in its customer goodwill and business methods. Given the presence of a legitimate business interest, the court was willing to enforce the non-compete restrictions but not to the full extent of the franchise agreements. As written, the non-compete provision contained in those agreements extremely aggressive: (1) A two year term (2) A restricted geographic territory consisting of all NYC and Long Island and (3) The entire ice cream industry — retail and wholesale, mobile and fixed. The court narrowed this slightly and enjoined Tsirkos from competing in the retail ice cream business for two years anywhere within 5 miles of his former territories. (1) The Prospectus Defense: New York’s Franchise Sales Act provides that a franchise may not be sold without the franchisor first providing the franchisee with a prospectus that discloses certain information about the financial prospects of the franchise. N.Y. Gen. Bus. Law § 683. That law further provides that rescission of the franchise agreement is possible in the case of a “willful and material” violation of this requirement. In this case, Tsirkos claimed that he never received a prospectus from Mister Softee and, in light of this, that he was entitled to rescission of the franchise agreements, rendering the non-compete provisions unenforceable. The court rejected this argument out of hand, finding that even if Mister Softee failed to provide Tsirkos with a prospectus prior to his purchase of the franchises, there was no evidence of willfulness. This makes sense and is consistent with 683’s purpose, which is to prevent fraud in connection with the sale of franchises (e.g. bogus promises about franchise profits). 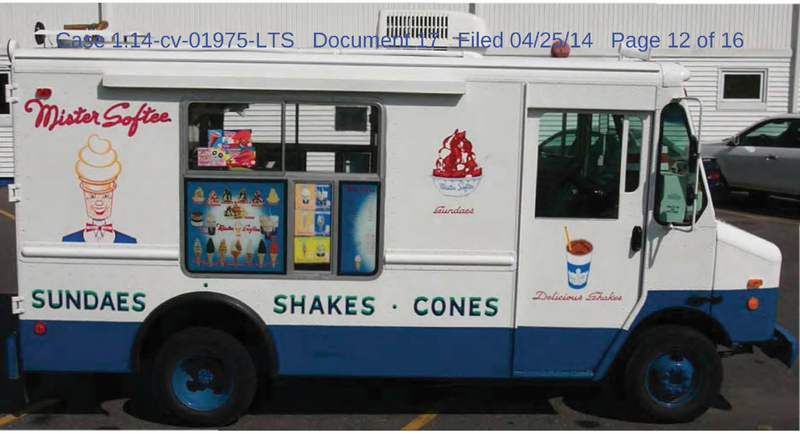 (2) The Prior Breach Defense: Apparently, Tsirkos also argued that Mister Softee had breached the franchise agreements first by allowing certain franchisees to operate their own non-Mister Softee branded trucks. Now this was an interesting point: If Mister Softee was letting some franchisees operate rival ice cream trucks in the same territories, it would obviously cut into a franchisee’s profits and likely breach the franchise agreements. But apparently Tsirkos only raised this argument in an affidavit—- This argument never found its way into any motions or pleadings. (3) Mixing Non-Compete and Trademark: From the record, it seems fairly evident that Tsirkos was acting in bad faith. His Master Softee trucks were a blatant rip off of the Mister Softee brand. Tsirkos’s trademark infringement made the non-compete claim easy: Recall that the legitimate business interests justifying the non-compete were Mister Softee’s customer goodwill and its business methods. There was already evidence of actual customer confusion, so the threat to Mister Softee’s goodwill was clear. But remove that from the equation: Suppose Tsirkos feels Mister Softee breached the franchise agreements and he decides he is going to compete against them, but in a manner that is fair: He launches a fleet of rival ice cream trucks, calls himself Ice Cream King and uses a totally different design and color scheme. In that case, there is no claim for trademark infringement. And the non-compete claim? It’s much weaker. There’s no threat to goodwill or irreparable harm in the form of customer confusion. And the legitimate business interest at issue? Arguably, only Mister Softee’s vague claim that its “business methods” must be protected. That’s a totally different ballgame. Jonathan Pollard is a trial lawyer and litigator based on Fort Lauderdale, Florida. He focuses his practice on defending non-compete and trade secret claims. Jonathan routinely represents doctors, corporate executives and other high level employees who are switching companies, or, who have started their own ventures. Beyond litigation, Jonathan advises employees, companies and business owners regarding restrictive covenant issues in connection with employment contracts, separation agreements, hiring decisions, the purchase or sale of business interests and the execution of commercial leases. Jonathan has been interviewed about non-compete issues by reporters from INC Magazine, the BBC and The Tampa Bay Times. In addition to his background in non-compete and trade secrets work, Jonathan has broad experience as a competition lawyer, generally, and has litigated numerous cases under both the Sherman and Lanham Acts. He is licensed in all Florida federal and state courts and routinely represents clients in Miami, Fort Lauderdale, West Palm Beach, Fort Myers, Tampa, Orlando and Jacksonville. His office can be reached at 954-332-2380. For more information, visit http://www.pollardllc.com.